First, thanks for all the wonderful comments left on Monday's post. You guys made me cry MORE, dammit! I am very lucky to have such readers and friends--over the months and years that I've been publishing, many readers have become friends, though most of us haven't met in person. What happened (we think) was, she stepped on the remnants of a wheat stalk in the field near our house, where we take her for walks. 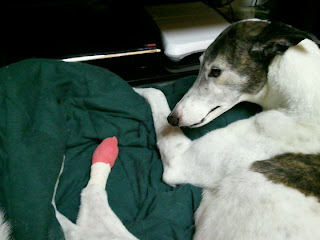 Never yelped or anything, even as it was gouging a hole in her foot. Greyhounds are funny. 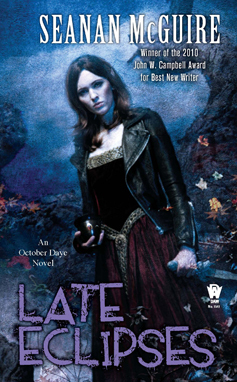 Today the mail lady brought me an ARC of Seanan McGuire's upcoming Late Eclipses, the fourth in her October Daye urban fantasy series, plus a copy of Seanan's music CD, Wicked Girls. I had no idea she sang, but she's amazing! The Toby Daye series is my current favorite, adult or YA. The main character is a half-human, half-fae (changling) detective who says she's not a hero (she's lying). It's noir, but not in a self-conscious, trying-to-be-Raymond-Chandler way. It's published for adults, but I can't think of anything in it that would be inappropriate for teens. There's even a really sweet teen fae dude, Quentin, on whom I have an age-inappropriate crush. Hold onto your candles, folks! The darkness deepens and the tension spikes in AN ARTIFICIAL NIGHT, as this series just gets better and better with every page. The Toby Daye books blend a complex, realistic faerie world with the dark wit of the best film noir. McGuire's nobles and ruffians (and noble ruffians) feel real enough to touch--not that I would dare. Hands down, my favorite urban fantasy series. Anyway, according to my cat Misha, my time at the computer is over, and my time in the kitchen making his food has begun. Awe, poor Meadow. She's beautiful, and I think I've failed to mention how much I love her name. When we adopted ours (many years ago, she has since passed) her racing name was Racing Spirit. We just called her RC which is what the rescue had been calling her. Brooke: Aww, Racing Spirit is a great name, and so is RC! Meadow's racing name was Pa's Sue B. Yeah, it makes no sense and isn't catchy at all. I think her call name was "Medway" (also makes no sense, but we call her that sometimes), so the adoption agency named her "Meadow" and we kept it. I saw on a dog obedience show somewhere that two-syllable names that end in a vowel are best, because you can say them happily. One-syllable names can get mixed up with commands. I think most people instinctively choose names like these for their dogs because they're fun. That end in a vowel *sound*, I mean, not necessarily a vowel letter. I love that series so much! Oh, Meadow. You poor, poor baby! Poor Meadow! They are so frail looking yet show no pain. My Whippit had a hole in his side from hitting the corner of the coffee table - never made a peep. mercurialdragon: I know, isn't it wonderful? They just keep getting better and better, which is rare for a series.